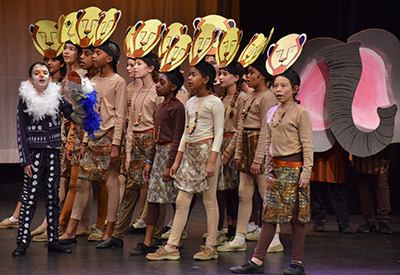 The Blair Family Center for the Arts provides a state-of-the-art home for a robust arts program at Bullis—music, theater, dance and visual arts. To showcase the talent and accomplishments of all of our student-artists, a wide array of performances and shows is scheduled throughout the year, for all grades. Some provide opportunities for all students to participate through their classes, and other are extra-curricular opportunities. Listed below are all the major events; other smaller event, shows and performances are also held throughout the year. Check out our photo galleries from recent events, too, by clicking on any of the links below or clicking here and selecting Stage & Studio to see latest video stories. Check the Arts Calendar at right for dates for all shows. 5th Grade Musical, in spring. 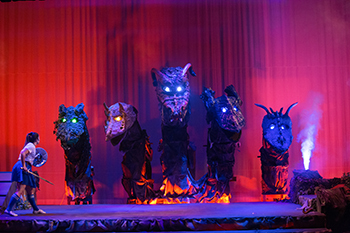 Read about and view a photo gallery of 2017’s performance of The Lion King. Third Grade Musical. Read about and view a photo gallery of 2017’s performance of Walking to Venus. Fourth Grade Musical. Read about and view a photo gallery of 2017’s original production of Oregon Here We Come. Middle School Winter Musical. Read about and view a photo gallery of 2017’s performance of Peter Pan. Fall Theater Festival. Read about and view a photo gallery of 2017’s show. Fall Jazz and Dance Program Show. Read about and view a photo gallery of the fall show, Purple Rain. AP Art Shows each trimester highlight student work from the previous trimester (or summer). Students curate, promote and produce all AP art shows. Read about and view a photo gallery of 2017’s show. Advanced Art Show each spring presents student work from this class of 10th and 11th graders, before they proceed to AP Art. Open Studio Art Show presents work from the fall after-school art elective. Read about this year’s show and view a photo gallery. Middle School Art Show presents work by 8th grade majors and minors and Middle School open studio students. View a gallery of 2016’s show. All Staff Art Show each winter provides an opportunity for the community to enjoy the work of all Bullis staff members. Each show includes not just the Arts faculty but also artists throughout the Bullis staff community. 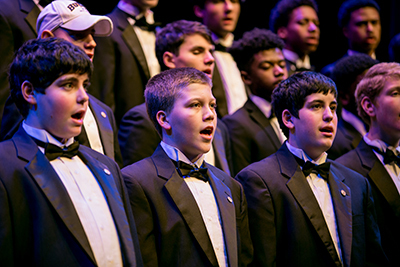 December’s Festival of Light—one for the Lower and Middle School and one for the Upper School—features chorus, all bands and orchestras and dance. View a photo gallery of the 2016 Upper School Festival of Light. View a photo gallery of the 2016 Lower School/Middle School Festival of Light. Jazz Cafes each trimester, featuring the Upper School jazz program including Jazz Workshop and Jazz Ensemble. View a photo gallery of our Jazz Cafe.